How is September almost over!?!? 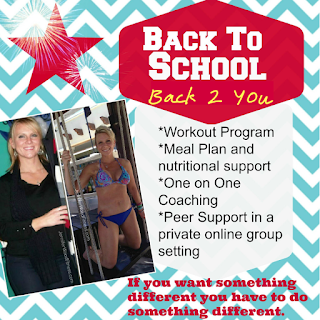 Did you set a goal to get back into a routine and/or work on your nutrition; but, it just hasn’t happened yet?? Maybe you need accountability and a place for support and help with what to eat, how much to eat, ugh!! it can be so confusing right!!?? It really doesn’t have to be! I got you girl. Or maybe you know what to eat, but you just lack motivation and need a place to recommit and be accountable. This group is for you! Right now our next FALL group is kicking off and the energy is contagious! Its what motivates me daily to get my 💪🏼workout done, and make healthier choices (most of the time )! The hubby and I recently finished this new 4 day a week program and got really great results. I didn't really change my nutrition much and we worked out less. Many of my clients who struggled to stick with a program did the entire program and loved it. I have seen a huge success rate with this one. I will be restarting this program if you'd like to do it with me for round 2! 👉being challenged and encouraged in an incredible private online group including members from the US, UK and Canada as we pushed each other to achieve our potential! I am am looking for THREE more busy moms who are serious about making some changes. Busy moms who want some accountability, guidance, motivation and support to get it done! It's perfect timing if you are looking to start something new as the school year begins, moms... we know you're busy, but this fits into ANY schedule. Email me at jenniferwoodfitness@gmail.com, or contact me on Facebook, or Instagram if you'd like me to send you the details, or if you want me to share the link to the free sample workout with you!